Become Your Own Central Bank. Central banks are the masters of the global financial sytem, and they hold most of the worlds gold for good reason. So at last a way to save, in a form where you do not need to worry about deflation or inflation. 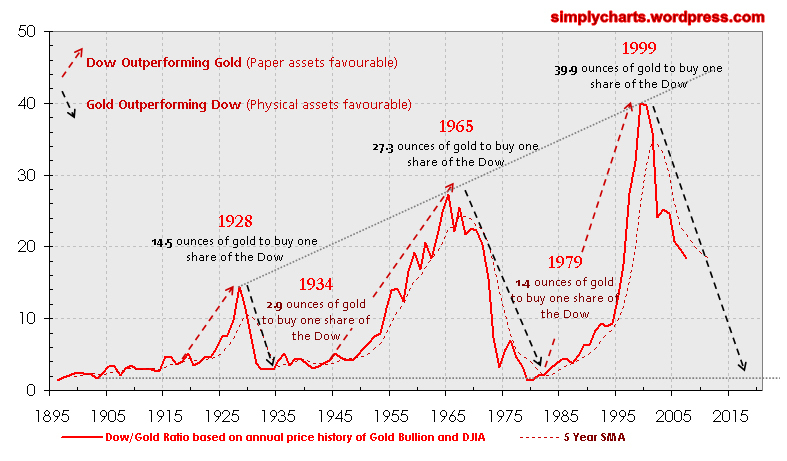 Remember gold did well in a deflation (1930s) and inflation (1970s) (check the gold/dow ratio). It will be unlikely that any long term bulls would hold out that long for the "home run". It'll probably head to 2 which is a phenomenal gain from here (8), and by that time a lot of other assets will be cheap and will be better opportunities. 90% of the gains will come in the last 10% of the move. It'll probably go lower, but the danger of consfication, capital controls, illiquidity increases as more eyes are looking into the asset class. The DOW may cease in it's current form, but businesses in energy, water, property etc providing all the essentials will still be around paying dividends. What would you say about the dow/silver ratio? Would this be the same situation for the FTSE 100 or is there any data available for this?